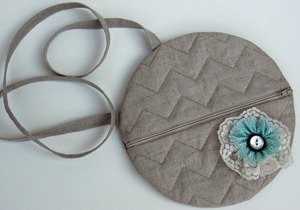 You can add a strap to any of these pouches while it's in the hoop. 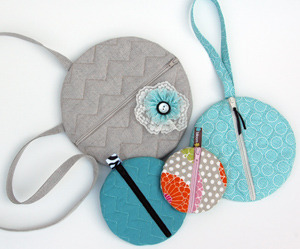 There are 4 sizes of Circle Pouches in this set. They're made 'in the hoop', fully lined and have no raw edges or visible seams inside. 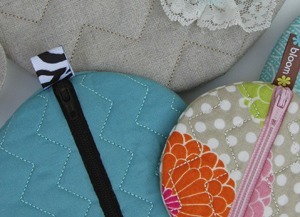 These pouches feature chevron quilting on the front. Files for quilted backs are included too. Each case is fully lined. There are no raw edges or visible stitching inside. You end up with a professionally finished case inside & out. The finished size of the cases are approximately 4"x4", 5"x5", 6"x6" & 8"x8" You have the option of adding a small ribbon loop or any length strap to the cases. Note, the flower embellishment shown is not included. It's a strip of fabric & lace gathered along one edge. 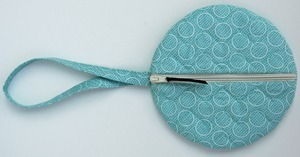 You can make them into wristlets or over the shoulder pouches.